Greetings from Silent Word Ministries. 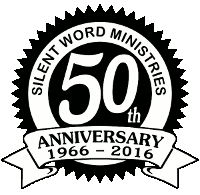 We are very excited to announce that this year SWM celebrates 50 years of ministry! God has been faithful and has greatly used this ministry. “Faithful is he that calleth you, who also will do it” (I Thessalonians 5:24). In 1966, the name Silent Word was created for the “The Silent Word” newspaper. Even in the early days, God was preparing SWM to reach the Deaf worldwide. As the Deaf Bible Institute, tracts, and literature were printed and distributed to the Deaf, SWM slowly became the Silent Word Ministry. The ministry continued to grow and is now Silent Word Ministries, Inc. – many ministries, reaching the Deaf World for Christ. We are constantly amazed to see what God is doing through SWM. There are several ways you can help us celebrate this special year. Post your historical pictures of SWM people or events on Facebook, Instagram, or Twitter. Use the hashtag, #SWM50yrs. Or, send by postal mail. – You might see your picture in The Silent Word newspaper. Send us a testimony of how SWM has impacted your life – Some will be printed in the newspaper. Visit the SWM office in Trenton, Georgia. Come see what the Lord has done! Send a special anniversary gift. 100% of your gift will be used in SWM “free” evangelistic outreach ministries to print tracts and the DBI, send The Silent Word newspaper, and send free materials to foreign missionaries and nationals. Some may want to send $50 to celebrate 50 years of ministry. Naturally, gifts of any amount are appreciated. SWM will send The Story of Silent Word Ministries booklet to all who respond and request the booklet. New at SWM – Recently we have been broadening our outreach through the Internet. The Internet helps us go places we could not go in person and reach people we might never have met otherwise. Our Deaf Bible Institute is now available online. We also have a website called Follow8Steps.org to help disciple new Christians, whether deaf or hearing. Just recently, some new outreaches have been started. SignTheBible.com features filmed Bible studies in American Sign Language (ASL). Right now, we have Bible studies on Acts, Revelation, and Ephesians. An “Old Testament People” study has just been started. There are also several videos with clear presentations of the Gospel. David Bennett, SWM International director, has begun creating a unique series called “Creation to Christ.” It uses gestures, rather than actual signs, to teach and is designed to teach deaf people who have little or no language. SWM is filming, and volunteers are editing and posting these videos to SignTheBible.com. As SWM turns 50 years old, we remain committed to reaching the Deaf World for Christ on your behalf. There is still much to be done before the Lord’s return. Thank you for your faithful prayers and support, which help make this unique missionary ministry possible.